A traditional herbal supplement that helps maintain a healthy circulation by establishing body’s natural balance. 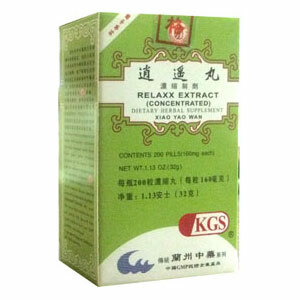 Move Stuck Liver Qi, Strengthen spleen, nourish blood, restore harmony between Spleen and Stomach. For all types of stress-related problems, especially female depression with blood deficiency, bloating, poor appetite. This product may be helpful to those with gynecological disorders such as irregular menstruation, pre-menstrual syndrome with abdominal pain, neurasthenia associated with menopause; internal disorders such as chronic hepatitis, pleurisy, cystic hyperplasia of the breast; with symptoms of headache, vertigo, dry mouth, dry throat, fatigue, poor appetite, moodiness, possible alternating feeling of hot and cold, possible irregular menstruation, breast distension. Also used for chronic liver problems where there is no jaundice.